Be sure to stop by my table at the upcoming Autoptic Festival (August 8-9, 2015) as I’ll be showcasing the work of Combat Paper NJ. 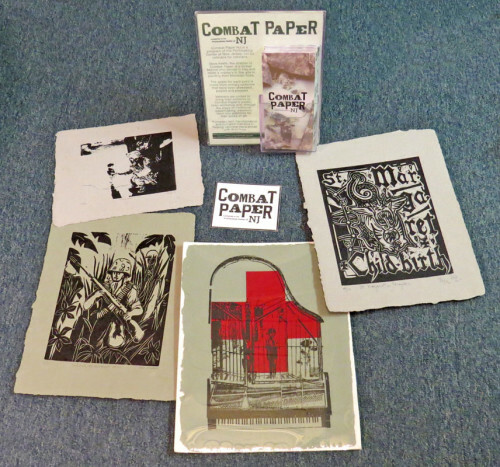 Combat Paper is a program of the Printmaking Center of New Jersey, run by veterans for veterans. Dave Keefe, the director of Combat Paper (and more importantly my nephew), is a former Marine who served in Iraq and holds a master’s in fine arts in painting from Montclair State. The paper for each print is made from military uniforms that have been shredded, pulped and pressed. Veterans are invited to bring their uniforms to Combat Paper’s weekly open workshop and, through the steps of traditional papermaking, transform them into platforms for their works of art. A process both transformative and cathartic that aids in helping veterans move ahead with their lives. Couldn’t be prouder of the work Dave has done, so be sure to stop by my table (#57) to check it out! This entry was posted in Conventions and tagged Autoptic, Autoptic Festival, Combat Paper, Dave Keefe. Bookmark the permalink.